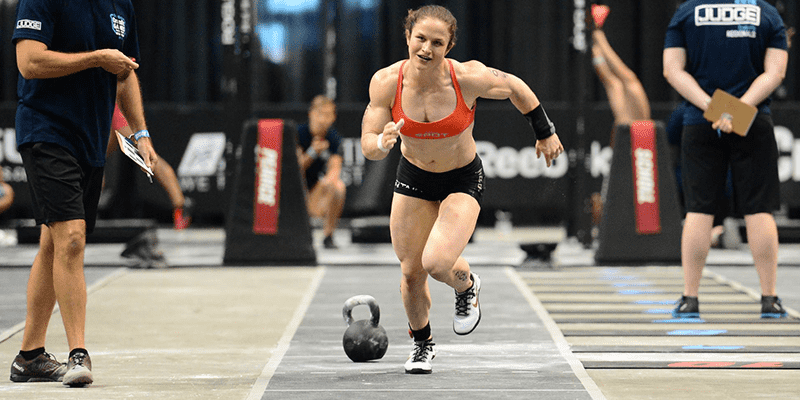 CrossFit Games Athlete Kari Pearce has 18 years of gymnastic experience under her belt. Find out what she thinks you need to focus on to improve your skills, strength and technique. These tips come direct from Kari Pearce herself. I recently attended an excellent seminar that she led at Argo Athletics in Berlin where she worked through all the following drills, workouts and tips. Her favourite gymnastic exercises are handstand walks and her least favourite are toes to bar. She considers grip strength to be a weakness of hers that she is currently working on in order to improve. A strong core is obviously essential to maintain the handstand hold, but according to Kari, controlling the movement with your fingertips is where the real skill lies. Splay your fingertips slightly and press them hard against the floor. This will help you to balance and control the exercise. Fixing a point on the floor can also help you to maintain a rigid body position without swaying around too much. When Kari competed as a gymnast she would regularly be required to hold a 5 minute hollow hold as part of her normal training sessions. Give this a try and see how long you can hold one for. This is a good test to use for testing your core strength to see if it is improving as it is easily measurable. When it comes to technique for both hollow holds and rocks, pick a point on ceiling to stare at and fix your eyes on it. Strict pull ups. Slow every descent to take 3 seconds. In her seminar, Kari stressed the importance of keeping tight movement patterns and always focusing on your form. A drill she uses is to start in small circles then move into larger movements until you are performing the full movement. Do this in 3 sets of 6 reps.
Kari stressed the importance of building up a good resistance to fatigue in Gymnastics. Technique and movement are so important, but you must also be able to maintain these during longer workouts. 10 sets of kipping pull ups. 20 -35% of your max unbroken set. Tape your thumbs up and wrap them around the bar. Strict ring dips are a great way to build powerful chest, arm and shoulder strength for your body. They also help to improve your balance and coordination. Keep the rings pointed straight, or turn them out slightly to make the movement even harder. Try this exercise from Kari to get used to shifting your bodyweight from side to side during the handstand walk. A more upright body will lead to a slower but more controlled walk. Leaning the legs forwards will help to go faster but you will have less control.